Jeffrey Khaner, principal flautist of the Philadelphia Orchestra since 1990, is one of today’s most distinguished orchestral musicians. He is also a commanding soloist. This recording, his fourth solo CD for Avie, demonstrates his skills as an arranger as well, as he turns his attention to Brahms’ beloved Sonatas originally written for clarinet, later transcribed for viola by the composer. Khaner’s endeavours mirror Brahms’ own aims: to ensure wider dissemination of the music by adapting it to different instruments. 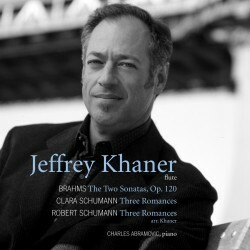 The ingenious fillers are Khaner’s transcriptions of a pair of Three Romances, a set each by Robert and Clara Schumann, close friends of Brahms’. These unabashedly romantic works lend themselves perfectly to the flute and to Jeff’s masterful interpretations.